The legacy of arguably the biggest name in animation history will once again continue throughout 2012, with the announcement of another exciting family entertainment spectacular featuring one of the most-adored characters from the Disney empire. 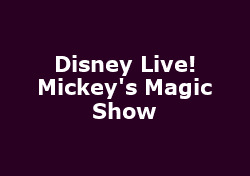 Mickey's Magic Show is the latest in a very long line of Disney Live shows and is coming to the UK for a summer tour! Starring all of Mickey's friends including Donald Duck, Goofy and The Mad Hatter, as well as Minnie Mouse of course, the show will feature dazzling magic tricks and amazing set-pieces (including the famous 'dancing brooms' from Fantasia and a spot of levitation) that will enchant children and accompanying adults alike. In true time-honoured tradition of the Disney On Ice shows in recent years, you can expect a BIG show with lots of singing and dancing, as well as clever illusions and family fun for all. Timed to entertain the youngsters during the school holidays, the first stop on the tour is Aberdeen from 6th to 8th July, followed by Glasgow from 11th to 15th July, with several more city venues following on until a week in Liverpool from 29th August until 2nd September. We will have tickets for all shows from Friday onwards at 10am, priced at around £19.